By educating me about Australia, I heard a lot about Aboriginal people. This is a complex topic, though very interesting. Therefore, I decided to devote my free subject to Australia’s Aboriginal people. They are fully part of Australian culture and history. The Aboriginal culture is the oldest living culture in the world. Many mysteries surround Australian prehistory, but it is believed that the first humans settled in Australia more than 50,000 years ago and that they came from the Indonesian archipelago. This semi-nomadic hunter-gatherer society was traditionally organised in tribes, themselves being composed of clans with a common ancestor. For its sustenance, the society relied on a thorough knowledge of the natural environment, utilising it extensively and sustainably. Because of their tribal organisation, Aboriginal people could not resist European colonizers. This enabled the British to declare Australia terra nullius and to appropriate the territory. Indigenous were expelled, killed or herded into reserves where thousands of them died by contracting Western diseases. From 1910 to the late 1960s, as part of a "cultural assimilation" policy, some 100,000 Aboriginal children, known as “the sacrificed generation", were forcibly removed from their families to be educated as white children. In 1967, 90% of Australian voters said yes by referendum to Aboriginal voting rights. 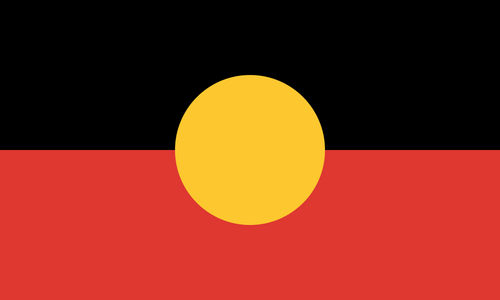 A 2011 census determined a population of 670,000 Aboriginal people, accounting for 3% of the Australian population. Nowadays, Aboriginal people are more affected by poverty than any other Australian group, and their life expectancy is less than 10 years the national average. 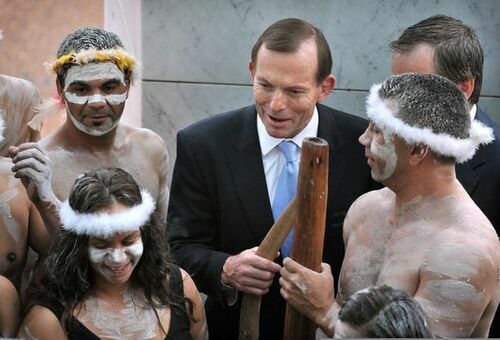 Tony Abbott with Aboriginal people.